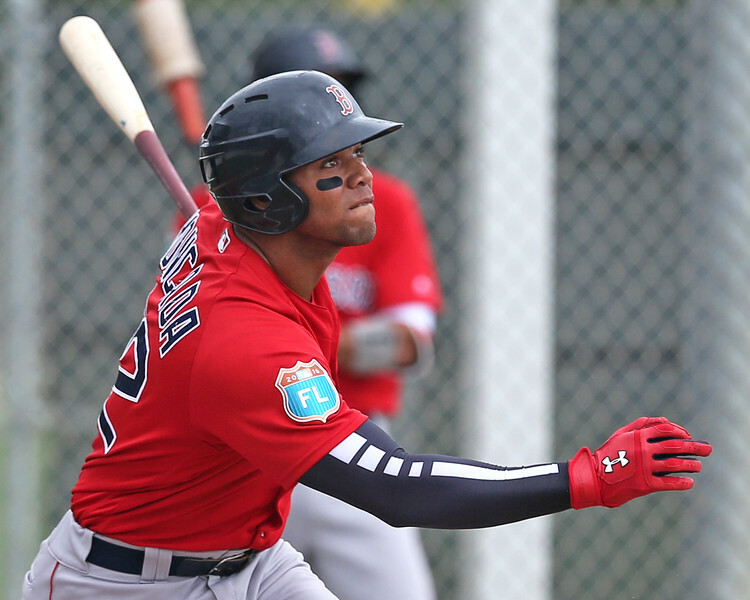 The Red Sox promoted top prospect Yoan Moncada (pictured, right) to Double-A Portland. The 21-year-old second baseman had a .923 OPS in the first half for Salem. Right-handed pitcher Ben Taylor and left-hander Jalen Beeks also got promoted from Salem to the Sea Dogs. With the 2016 First-Year Player Draft in the rearview mirror, SoxProspects.com Podcast 99 invited MLB.com’s Jim Callis to talk about the Red Sox' picks and who they can sign. The short-season Lowell Spinners opened the season with a roster that may soon feature many of the Red Sox' 2016 draft picks. Michael Kopech, the sixth-ranked prospect on SoxProspects.com, made his season debut for Lowell this week. SoxProspect.com’s Matt Huegel was there to break down the wild but effective outing. The Red Sox began the process of inking their 2016 Draft selections. They signed second-rounder CJ Chatham and reached a deal with sixth-rounder Steve Nogosek. Boston inked four more low-round selections while creating space in their bonus cap to potentially sign first-rounder Jason Groome. The Salem Red Sox clinched the Carolina League's Southern Division first-half title Monday with a win over the Potomac Nationals. The prospect-laden roster went 43-26 in the first half. With Kopech’s successful debut, Alex Speier of the Boston Globe spoke with the talented righty about his off-field issues and starting at Lowell. After posting a 2.20 ERA with Double-A Portland, right-handed pitcher Justin Haley received the call to Triple-A this week. He answered with eight innings of one-run ball in his first start with Pawtucket. The Red Sox signed catcher/first-baseman Cody Decker to a minor league deal. Decker played with the Padres last season and has hit safely in each of his first five games with Double-A Portland. Boston also inked a deal with right-handed reliever Casey Janssen, which was reported by Pete Abraham of the Boston Globe. Janssen struggled with the Nationals last season, but has been an effective closer in his career. He will report initially to Lowell. Ryan LaMarre and Deven Marrero received promotions to the big leagues to add bench depth. LaMarre played with the Reds last season and was hitting .313 at Triple-A. Marrero has struggled at the plate with Pawtucket this season, but has hit .302 in June. MassLive.com’s Chris Smith talked to the pair about their call-up. Mauricio Dubon will compete in the Carolina League All-Star Game on Tuesday, and MiLB.com’s Damien Sordelett detailed the personal journey for the No. 12-ranked prospect. Greenville added three late entries to the South Atlantic League All-Star Game this week: catcher Austin Rei, right-hander Anyelo Leclerc, and third baseman Mitchell Gunsolus. They will join a contingent of five other Drive players already selected for the game. Rei is batting .216/.346/.301 with 33 strikeouts and 21 walks in 46 games this season. Leclerc, although old for the league, has been dominant out of the bullpen to the tune of a 1.77 ERA and a 0.885 WHIP with 42 strikeouts in 40 2/3 innings. The latest addition, Gunsolus, has a line of .245/.352/.411 with seven home runs in Greenville this season. 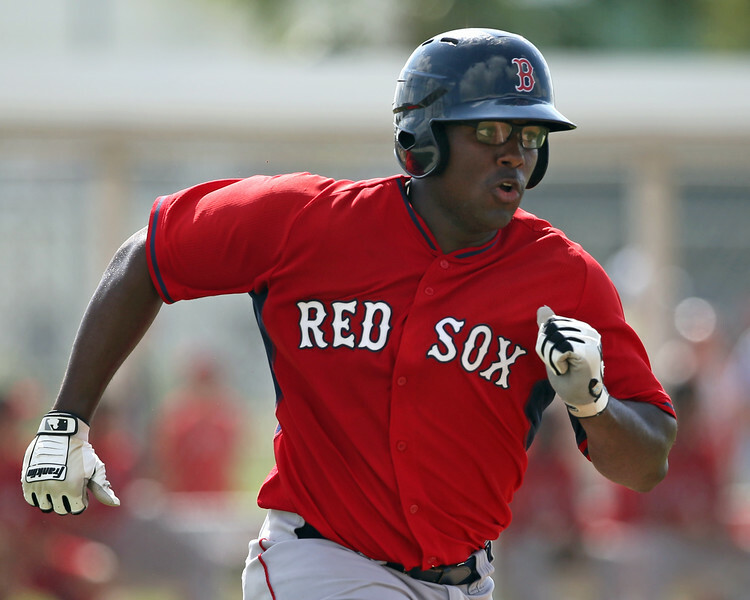 Rusney Castillo was placed on outright waivers this week. MLB Trade Rumors reviewed the Cuban outfielders’ struggles at Pawtucket this season. Ockimey’s emergence as one of the top prospects in Low-A has been an encouraging development this season. After posting an OPS over 1.000 in his first two months, Ockimey (pictured, right) answered a mini-slump at the start of June with a big week. Plate discipline has been a key to his success, as the first baseman has walked 52 times, twice as many as he did last season. Haley takes home the Pitcher of the Week Award for the second week in a row, thanks to a dominant Triple-A debut. In eight innings, Haley allowed only four baserunners. The righty has been able to limit damage against him, allowing just 20 walks and one home run in 69 1/3 innings this season.